Our Claire reckoned she was a dab hand in the kitchen... so how did she fare when she signed up for a cookery masterclass at top eatery Shu? It looked like a pretty good Eton Mess to me. As far as head chef Brian McCann was concerned, however, "mess" was the defining word. This was a masterclass in fine cooking, and I was failing fast. "The main ingredients are strawberries; why have you put so many blueberries on it?" he asked. And that was supposedly the easy bit. Also, who knew that drawing balsamic oval shapes on plates could be so tricky, or that there's a lot more than meets the eye to piping meringue from a white fabric tube? "Stop waving your hand round in circles like an angry wasp; keep it still," advised one of my fellow cooks. This was clearly a lot harder than it looked. The sweet, which came with blueberry and elderflower cream and the most mouth-watering vanilla gelato - "no egg; it's made with yogurt and sugar" - was a true delight at the end of a crash course in culinary skills. It was also the second of two dishes which I prepared, having signed up as one of four trainee chefs at the highly acclaimed Shu restaurant on Belfast's Lisburn Road. And it all took place under the guidance of Brian, who took part in BBC series The Great British Menu in 2011, and his sous chef Matthew Jordan (25), who's been there for five years. There were six of us all scuttling around the restaurant's (very hot) main kitchen, but by all accounts our job was simple: follow the instructions and replicate the dishes cooked by the dynamic duo. In reality there was a lot to remember in a short space of time, and my previous belief that I was a dab hand in the kitchen quickly evaporated. We were there ahead of the launch of the Shu Chef Apprentice Programme for a second successive year, which sees the eatery's co-owners, Brian, and Alan Reid, join forces with Belfast Metropolitan College. They aim to give four budding cooks aged 16-24 first-hand experience of working with the finest seasonal produce in a professional kitchen, with the very best chefs in the business. Getting a taste of the tasks involved in preparing our main dish of roast halibut, pea puree, Jersey Royals, shallot and caper dressing and roasting juices, was eye-opening and challenging in equal measure. There was a lot of poking and prodding (potatoes, the fish), dipping and dabbling (the spoon into sauces, puree and dressing) and dancing (around the kitchen trying not to get in the way) with timers constantly beeping. • Washing the skin off potatoes, rather than peeling them. • Breaking off a bit of asparagus stem before removing the skin on the remainder of the stalk with a peeler. • Using frozen garden peas to make puree, which, incidentally, involves maximising the flavour and "sweating the stock". • Salting fish by dousing it from on high so that it covers all of it. When it came to cooking the halibut in the pan, it proved to be a delicate job of finding the right temperature between "hot" and "not too hot". Brian (41), who honed his skills in London two decades ago working with Marco Pierre White (in restaurants Mirabelle and Criterion) and Phil Howard (The Square), offered up advice as we went along. "If the pan's too hot the fish is going to burn on the outside," he said. "You can see that little white mark and that indicates roughly when you add butter. "The butter reduces the temperature of the pan and when you put it in it automatically foams, which gives a beautiful flavour and you baste the fish in the butter and it gives it a lovely caramelisation. "The fish juice also comes out into the butter and you put that butter into the sauce - with beautiful little capers, raw shallots, sherry vinegar, fish juices and chicken, so it's really unctuous, delicious sauce." What could possibly go wrong here, you may well ask. "It's not a pancake," he chided me as I flicked over my stubborn portion. "Sorry chef," I replied, feeling rather silly as my fish almost snapped into two. Brian tested our taste buds throughout, insisting we sample a variety of ingredients both pre- and post-cooking, including edible flowers picked from his own garden in Derriaghy. They included butterfly sorrel, camomile, wasabi, bronze fennel, cornflower, dianthus, nasturtium... but he also grows his own vegetables: zebra tomatoes, purple broccoli, and courgettes. The Shu chef apprenticeship one-year programme starts in September 2018, with students spending three days working in the kitchen, learning classical French and modern European-inspired cooking. It's a paid programme comprising 35 hours per week, with chef's whites provided. The partnership with Belfast Met means that the apprentices will also spend two days at college, learning the theory and practical elements of the job, and receive a City & Guilds Level 2 Diploma in Professional Cookery qualification. Brian and Alan are looking for "young, passionate people with a serious desire to enter the industry and to help shape the future of the hospitality industry in Northern Ireland and beyond". Shu, which is famed for its classical French and modern European-style cuisine, held the title of Best Restaurant in Northern Ireland at the UK National Restaurant Awards for three consecutive years from 2012-2014. 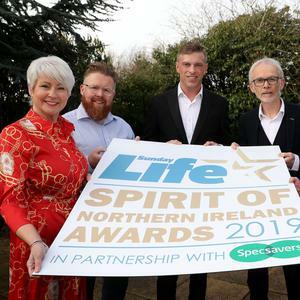 It also recently won the Best Casual Dining in Ulster title at the 2018 Irish Restaurant Awards, amongst a host of other accolades. Brian believes that year two of the apprenticeship scheme, which takes place in Shu's Centre for Cooking Excellence, will be even better than last year. "Our first year was hugely successful and allowed us to find two exceptional young chefs who have now been offered full-time jobs with us," he said. "At Shu we are passionate about nurturing our team and our apprentices to help them to push their own boundaries in providing exceptional cooking for our guests. "I started out as an apprentice chef so I understand the challenges and apprehensions that young people have at the beginning. "We have made this a fun, fantastic programme which is hard work, but also hugely rewarding and gets the apprentices right into the thick of it from day one. "We feel that there is a real shortage of skilled staff in the hospitality industry in Northern Ireland who want to further develop their cooking skills and to make a successful career of it. "We have had many young cooks through our kitchen, some of whom have gone on to work in some of the world's most renowned restaurants. "I want to urge any young cook who has a real passion and determination to succeed in this industry to get in touch and apply for this amazing opportunity. No experience is necessary, but the right attitude is essential." During his time in London Brian cooked for such famous names as Bono, Bill Clinton, Madonna and Johnny Depp, and he told how The Spice Girls even escaped through the kitchen of one of his restaurants back in the day. After coming home to Northern Ireland, he was head chef for the late Robbie Millar at Shanks Restaurant at Blackwood golf centre in Clandeboye Estate near Bangor, before joining Shu, where he has been for the last 14 years, helping the restaurant win dozens of top culinary accolades. Brian, who lives outside Belfast with his accountant wife Deirdre (41) and their children Beth Rose (11) and Luke (8) knows all about hard work. For him a typical day starts at 10.30am and ends at 11pm during the week, stretching to midnight at weekends. "It's long hours. You do five days, but the rewards are plentiful," he added. A chef can earn up to £30,000, with a head chef taking home even more. Christine Brown, head of Belfast Business School at Belfast Met, said she was delighted to be involved in a partnership with Shu for a second time. "The two chefs who took part last year immensely enjoyed their time, and to be offered a job at the end of it is the icing on the cake," she said. Max Johnston, from the Shu Apprentice Programme 2017 intake, said it was a "fantastic experience" which he "will value for the rest of my career". "I feel honoured to be offered a full-time job at the end of what has been a brilliant year of learning and creating and having fun with food, and would encourage any young person with a love of food and cooking to apply," he added.